Last night’s dessert was inspired by one of my favorite flavors of ice cream. 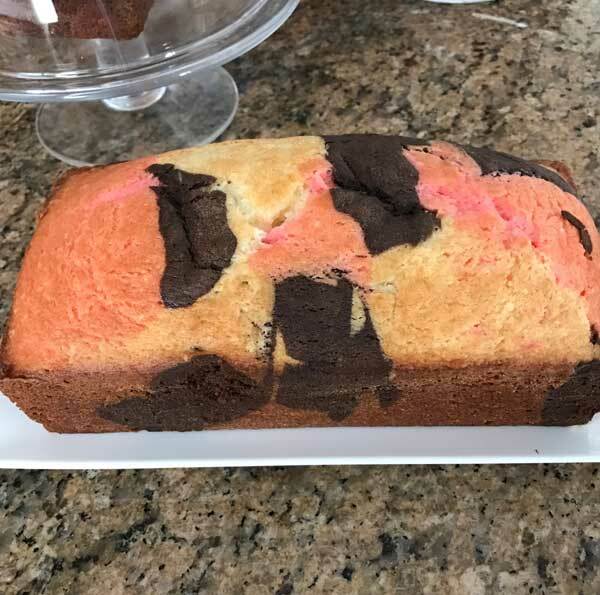 Introducing, “Loaf Pan Neapolitan Cake”. It’s a vanilla, chocolate and strawberry flavored cake baked in a loaf pan. I used cake flour so the texture is similar to a tight crumbed, light pound cake. And Loaf Pan Neapolitan Cake slices neatly, too. It would work well in a trifle. As for the flavors, I used what I had which was semisweet chocolate, strawberry gelatin and vanilla. The family liked the strawberry flavor, but I think next time I’d add a dash of strawberry extract in addition to the gelatin. 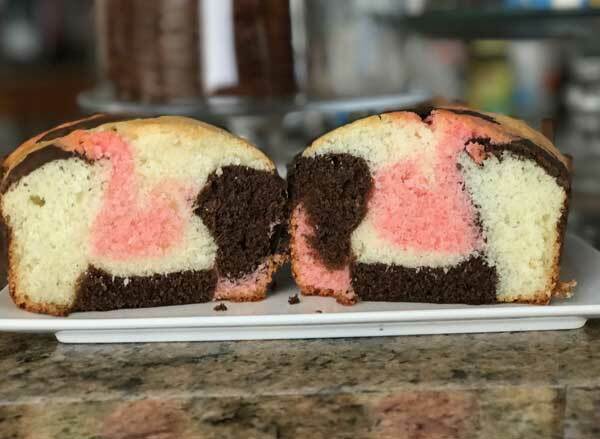 If you love Neapolitan cake and are adventurous enough to try this one, let me know what you think! 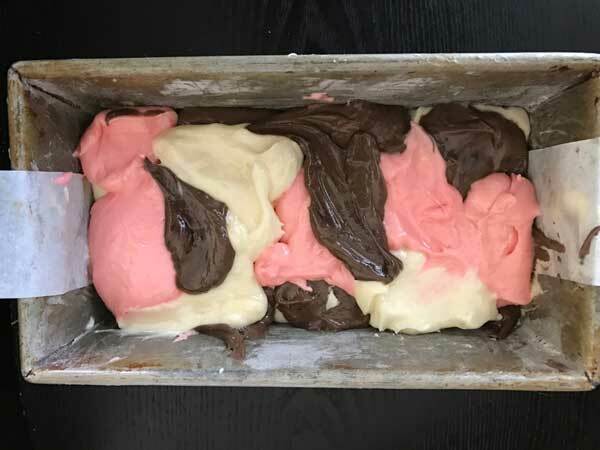 A tri-color cake of strawberry, vanilla and chocolate baked in a loaf pan. It's fairly simple to throw together if you have a kitchen scale, a handheld mixer and three medium size bowls. This cake has a light texture and while a glaze wouldn't hurt, I think it's best served with whipped cream and fresh berries. Preheat oven to 350°F. Grease an 8 1/2 by 4 1/2 inch loaf pan and line with a strip of parchment. Whisk or sift together flour, baking powder and salt. In a large mixing bowl, beat butter and sugar at medium-high speed with an electric mixer until light and creamy. Add the egg and beat until fluffy. Scrape down sides of bowl and add 1 teaspoon of the vanilla extract. With a heavy duty scraper, add flour mixture, and milk alternately, ending with flour mixture. Beat the batter with the mixer for about 30 seconds. Weight out 7 oz of batter and put it in a separate bowl. Repeat with another 7 oz of batter so that you have three bowls. The original bowl will be the vanilla. To one of the measured bowls, stir in melted chocolate, cocoa powder and oil to make a chocolate batter. To the other, beat in Jell-o powder and extract (if using). Add remaining 1/2 teaspoon of vanilla to the vanilla batter to pump the vanilla flavor. Drop spoonfuls of batter into the pan, alternating colors and creating your own pattern. Repeat until you’ve used all the batter. Bake the cake at 350 degrees F. for about 45 minutes or until a skewer inserted comes out with moist crumbs. Let the cake cool in the pan for about 20 minutes, then carefully remove from pan and let it cool completely. I should make that! Seems like Rainbow Cookies/Italian Layer Cookies are kind of trendy now. The new issue of the Food Channel magazine has a cake made to look like the Italian layer cookies. Thought of you when I saw it. That’s so funny you should mention that because I was thinking of making one with red, green and vanilla, flavoring it with almond and calling it “Rainbow Pound Cake” or “Venetian Pound Cake”. SO pretty! reminds me of those Italian layer cake cookies with all of the different colors. I never think to buy Neopolitan ice cream but it is fun to have all of those flavors in there.